I had some beautiful orange lampwork glass discs from ADAoutlet Lampwork Glass Beads; ADAs discs, in a range of vivid colours, have a hematite-like metallic edge that I have never before come across in lampwork. I knotted them on silk with lava stone beads, large dark purple freshwater pearls, tiny turquoises, yellow Greek ceramic beads and wonderful large, smooth deep purple glass rings from Stone Designs by Sheila; her studio is localised in the Pacific Northwest and she makes beads that immediately makes you dream of an enchanted forest. I made this necklace for my strong, kind, intelligent Auntie T because I know she likes lava beads. Lately, I have gone back to basics and knotted long chains of beads, like these Chinese and Delft porcelain beads. I knotted with simple silk or linen thread. The trick when you knot is to use a needle to push the thread close to the bead as shown in this excellent tutorial by Potomac Bead Company. I knot these long chains in the car or in front of the TV. The blue and white porcelain is soothing and simple, perfect for a new year, a fresh start. My grandmother Sonja Hahn-Ekberg (post coming soon!) was a world-renown textile artist. Her medium was Thai silk thread, and she taught me and my best friend Isabell to make bracelets using her technique. I remember us giggling, posing for the camera with our creations; one of the best afternoons of my fleeting teenage hood. I have had Thai silk scraps sitting around for ages, and suddenly I had an urge to try it. I bundled the scraps into my backpack and headed to the beach. At night, by candlelight, I pulled them out. After 5 minutes, dangerously close to the flame, I was hooked. I know now that I will never stop. 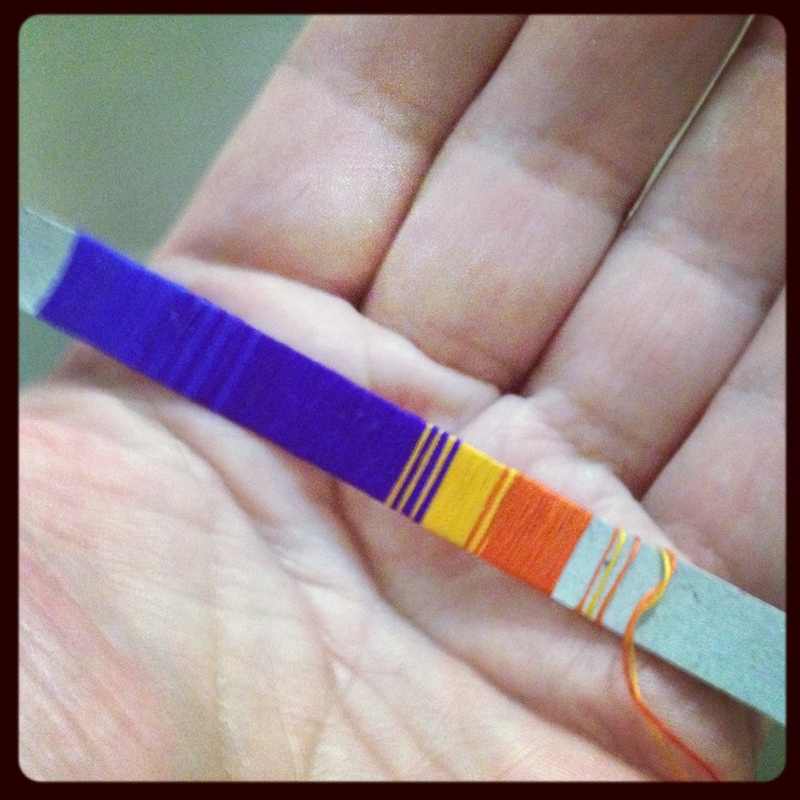 My first test strip is a far cry from the shimmering silk sheets my grandmother created, but it is a start. 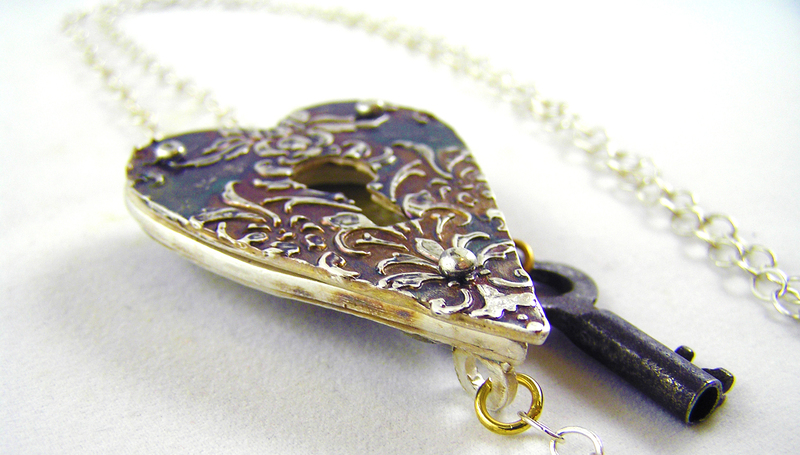 We have had a few people telling us that they found it hard to find photos of our jewellery in our blog. 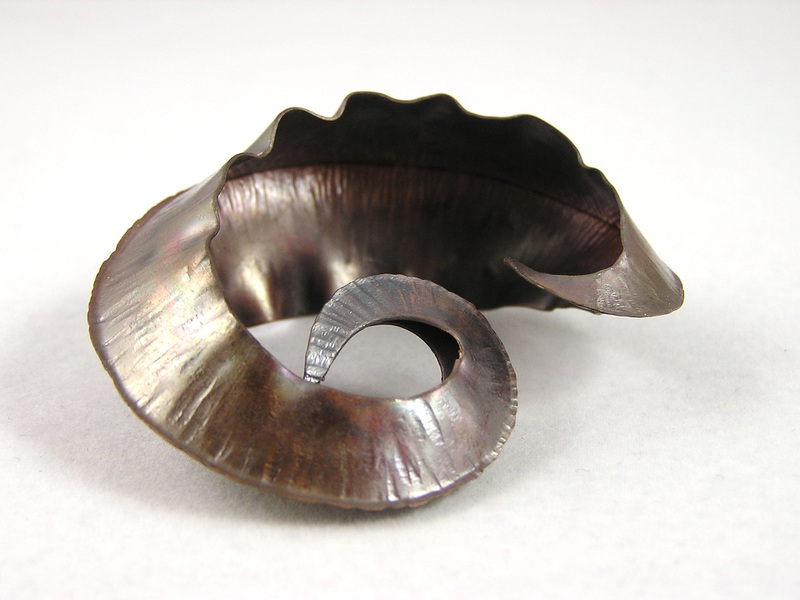 Therefore, we have now made a gallery page where you can see examples of our jewellery made by Jenny Ekberg. We will update the page when we make new collections. You can access the page through the “our collections” tab in the black menu above, or via this blog post. Hopefully it will now be easier to find our work in the maze of the World Wide Web. Please click on the images to get to the galleries. When I say “Kabul”, my four-year-old daughter squeals with excitement. 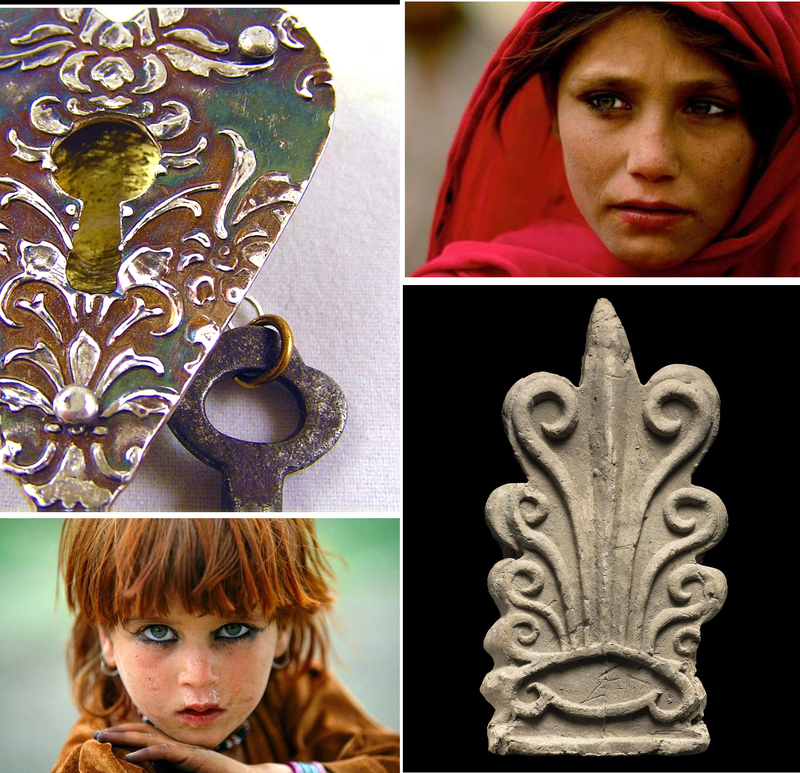 She remembers the exhibition we went to (Hidden Treasures from the National Museum, Kabul); the the Grecian-styled statues, the tiles in thousand shades of blue, the buttery high carat gold. I think of a city of war, injustice, poverty and suffering, where patches of brilliant architecture, art and colours shine through dust. I think about people of strength, courage, survival instinct and complexity. No, I haven’t been there, I have only watched TV, movies, documentaries, art exhibitions and, above all, met lots of Afghans; all of whom have been amazing in their own right, some tough as nails, some very intellectual and witty, some bound by traditions, some trendy or glamorous, some just incredibly warm and hospitable. They have all made a huge impression on me. 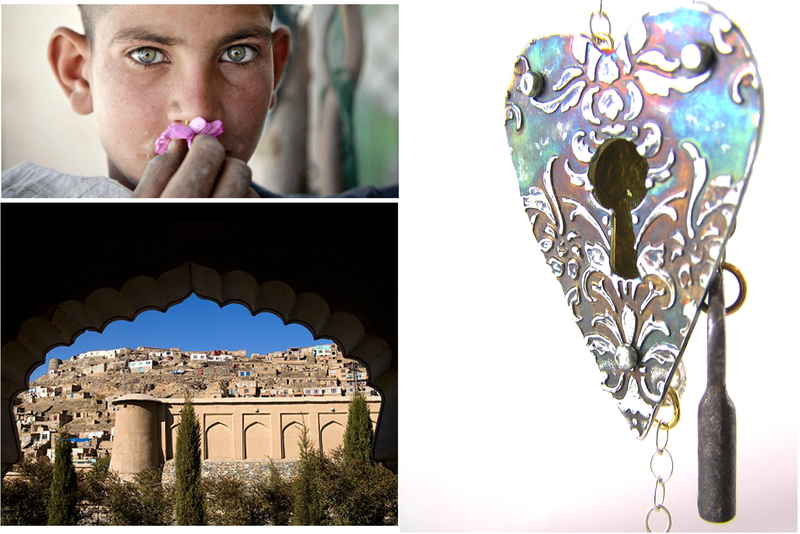 I made this fine silver heart inspired by the people of Kabul. 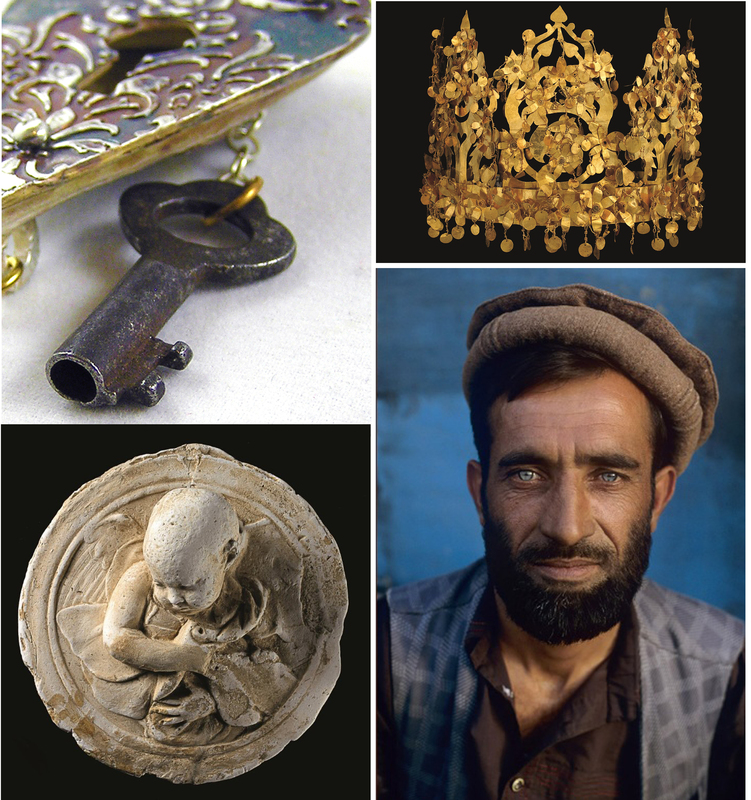 The architectural outside is crumbling but iridescent, and the inside is coated with that high-carat gold I have only really seen in old Afghan jewellery. It has a hidden compartment containing a piece of Afghan fabric holding incense. Material: Fine silver with 22 K gold filling, cloth, incense. Technique: Metal clay (PMC3), stenciling with slip, liver of sulphur/ammonia patina, cold joined. Who is it for: Myself, and my daughter Zoë when she is older and maybe wants to borrow it. 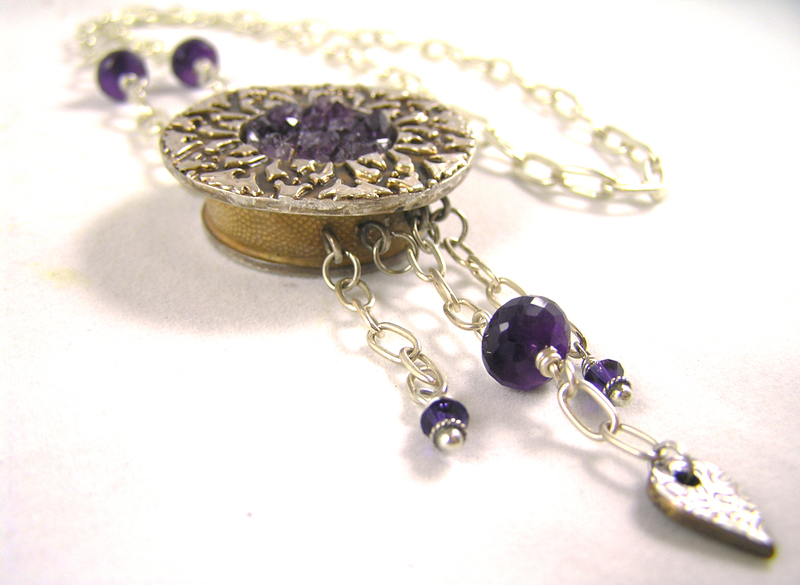 If you are a jewellery artisan and wants to know more about how I made this necklace, please contact me. I am happy to share all my “secrets”! 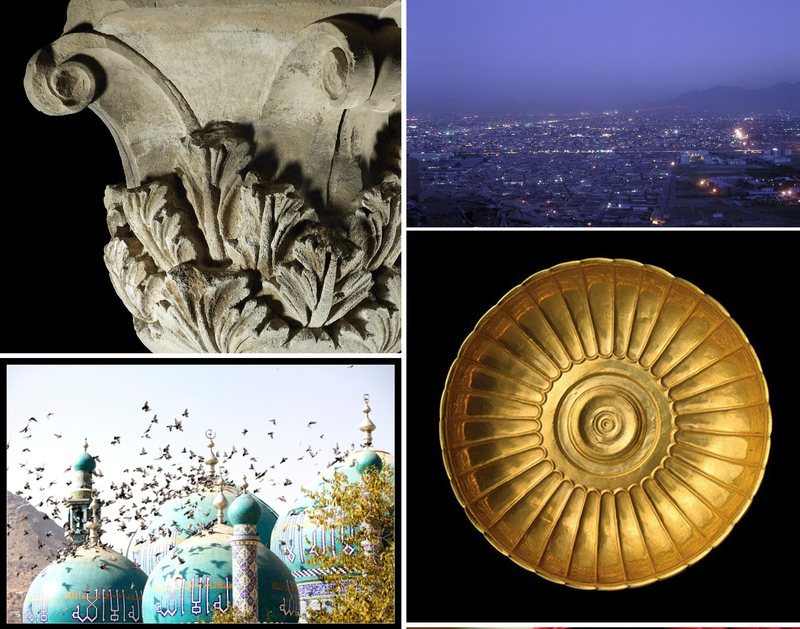 Image credits: Afghanistaninphotostumblr.com, National Museum of Afghanistan, Queensland Museum, Wikipedia, James St John, Brisbane. Just finished this necklace after tweaking, re-shaping and re-patinating for the millionth time; my version of the obligatory dream catcher necklace. I made it in fine silver using the same techniques as for my Kashgar ring, and with LOTS of effort and help from my husband managed to set this irregular cluster of amethyst crystal tips, as dark as the darkest violets in a springtime forest. For who? Myself this time! It is 00.30 so I better go to sleep. Outside the darkness is like black velvet and the poodles are howling at possums jumping on the roof like drunken ghosts.